Browse: Home / Issues / Salmon Farming / What is Salmon Farming? 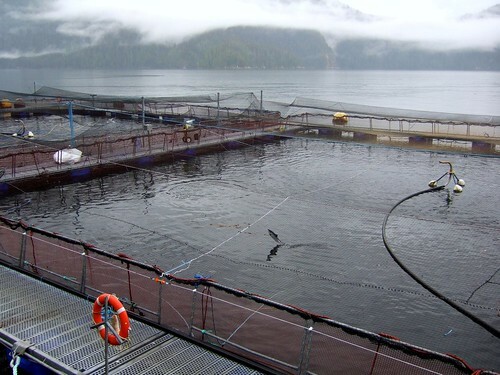 This type of agriculture may sound straightforward, but there are many concerns over its negative impacts of on wild salmon and the environment. The weight of evidence from peer reviewed scientific research from around the world indicates that open net-cage farming is negatively affecting wild salmon. We need to move beyond the debate and move forward with real solutions that offer protection for BC’s wild salmon. Watershed Watch is working towards this goal by conducting outreach in an effort to raise awareness of harmful industry practices, and producing and sponsoring peer-reviewed research to add to the science on this issue. We have also previously worked directly with industry in an attempt to conduct collaborative research to come to agreed conclusions on the negative effects of salmon farming. Watershed Watch has also represented aboriginal groups such as the Musgamagw Tsawataineuk Tribal Council and the Ehattesaht Tribe in examinations of salmon farm impacts in their traditional territories.